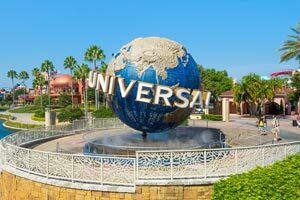 When you stay at Rodeway Inn International Drive in Orlando, you'll be in the entertainment district, within a 5-minute walk of ICON Orlando and Madame Tussauds. This family-friendly resort is 0.2 mi (0.3 km) from SEA LIFE Orlando Aquarium and 0.3 mi (0.5 km) from Ripley's Believe It or Not. Make yourself at home in one of the 297 air-conditioned rooms featuring flat-screen televisions. Complimentary wireless Internet access keeps you connected, and cable programming is available for your entertainment. Private bathrooms with shower/tub combinations feature complimentary toiletries and hair dryers. Conveniences include phones, as well as safes and desks. Don't miss out on the many recreational opportunities, including a nightclub, a health club, and an outdoor pool. Additional features at this resort include complimentary wireless Internet access, concierge services, and an arcade/game room. If you're planning a day at a nearby theme park, you can hop on the complimentary shuttle. Enjoy a meal at Cargo Bay Grill or snacks in the resort's coffee shop/café. Breakfast is available for a fee. The preferred airport for Rodeway Inn International Drive is Orlando, FL (MCO-Orlando Intl.). Only bookings from non-local guests are accepted. Guests whose residence is within 70 mi (112 km) of the property will not be allowed to check in. Please note that cultural norms and guest policies may differ by country and by property. The policies listed are provided by the property.